That pretty much sums up the Counter Extremism Project, an NGO launched Monday that aims to expose the financial, ideological and recruitment architecture that supports violent Islamic extremists. The new project will be led by many of the same people behind the anti-Iran organization, one of several pressure groups on Iran with influence in Washington. Mark Wallace, who served as U.S. ambassador to the United Nations under President George W. Bush, is the CEO of both groups, and former U.S. Sen. Joseph Lieberman is one of several Washington heavy hitters serving on both boards. While the Counter Extremism Project’s published materials do not specifically identify Islamic extremists as the target, organizers made clear at the launch event which extremists they have in mind. “I think the real hope here is to empower the majority within the Muslim world, who are as horrified as we are outside the Muslim world by violent Islamic extremism, to stand up and fight back,” Lieberman said at a news conference Monday in New York unveiling the organization. Governments and armies may do the lion’s share of the work, but there is a distinct role for private citizens, organizers said. 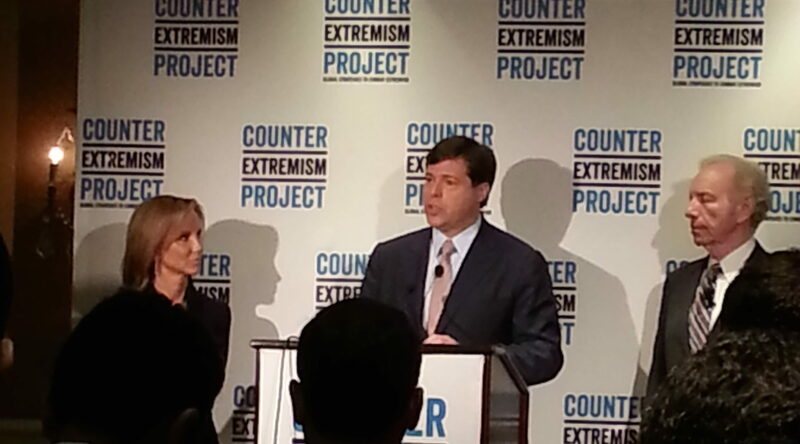 As United Against Nuclear Iran does with Iran, the Counter Extremism Project plans to help identify the sources of funding and support for violent extremists and share the information with lawmakers in a bid to propel government action. The project also plans to shame publicly those who do business with extremists, such as the buyers of oil from the fields in Iraq seized by ISIS, the extremist Sunni group in Iraq and Syria also known as the Islamic State. Wallace said he wants to work with governments across the world and not just the usual suspects. Though the Counter Extremism Project is backed by a host of pro-Israel stalwarts, Wallace sought to put distance between his group and Israel when asked if any partnership was planned — perhaps in an effort to leave the door open for partners who wouldn’t want to be seen as working with Israel. Some of the project’s work overlaps with that of existing organizations. For example, the project plans to compile daily translations of Arabic media related to extremism; the Middle East Media Research Institute already does selective translation of Arabic, Persian, Urdu-Pashtu and Dari media. And notably, some of the Counter Extremism Project’s work might seem to fall under the purview of the U.S. Treasury Department, which enforces U.S. laws barring financial dealings with terrorist organizations and implements U.S. sanctions legislation against Iran and other countries. But Lieberman said it’s not clear the Treasury Department has the statutory authority to do the same against ISIS — at least, not yet. “That’s where I think this Counter Extremism Project and the resources we’re going to build will supplement what the Treasury Department is doing,” he said. Fran Townsend, a former Homeland Security adviser to President George W. Bush who is on the board of the new organization (and that of United Against Nuclear Iran), said the idea is to create an effective public-private partnership. “We all have the experience in government. This is a problem that can’t be attacked by government alone,” Townsend said. “This is a problem that can’t be solved by military power by itself. The project has opened offices in New York and Brussels, where the European Union is headquartered, and plans more. Wallace declined to identify the project’s sources of funding except for Thomas Kaplan, a billionaire commodities investor who also backs United Against Nuclear Iran and, along with Wallace, runs the Tigris Financial Group. Kaplan, a New York native who was educated at Oxford, is married to Dafna Recanati, a scion of one of Israel’s wealthiest families, and has focused his philanthropy on Jewish causes, medical institutions and animal conservation. Among the board members of both the Counter Extremism Project and United Against Nuclear Iran are Gary Samore, who formerly served under President Obama as White House coordinator for arms control and weapons of mass destruction and is now at Harvard’s Kennedy School; August Hanning, a former director of Germany’s secret service, the BND; ambassador Dennis Ross, an adviser on Middle East affairs to Presidents Clinton and Obama and now a fellow at the Washington Institute for Near East Policy; and Irwin Cotler, a Liberal parliamentarian and former justice minister in Canada.